A key component to any office, a laminator applies a protective film to images to protect them potentially harmful environmental conditions. For a fully functional office, a laminator is essential. A key component to any office, a laminator applies a protective film to images to protect them potentially harmful environmental conditions. For long term care of papers and pictures, laminators can pay for themselves. Today we are going to assess some of the options you have when choosing laminators and how to choose the right one for you. There are two types of laminators: the pouch laminator and the roll laminator. Typically, a pouch laminator is used for smaller documents. Pouch laminators are most commonly seen in churches, schools, and businesses that laminate photographs, photo IDs and things like it. Pouch laminators are easy and fast to use and can fit in very small spaces. Roll laminators use sheets, or rolls, of plastic to laminate large documents. You simply place the document in between the rolls and let it laminate. If you consistently have larger documents, roll laminators make a lot of sense since you are using more film to laminate. 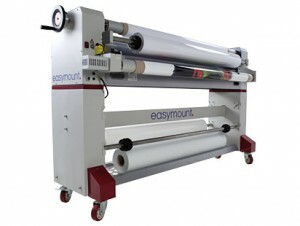 Roll laminators are bigger and take up much more space. One thing to consider before purchasing a laminator is whether you would like a hot laminator or a cold one. Hot laminators work with heat activated, pressure sensitive films. Hot laminators use heated rollers to melt glue on the film, then the film is applied to whatever you are laminating. Downsides of hot laminators can be that they could potentially cause issues for certain types of finishes and have a higher upfront cost. However, a thermal machine may save more money over time. A cold laminator uses plastic film that is coated with an adhesive backing and runs directly through the machine with no additional heat required. Cold laminators cost less up front and are easier on a variety of finishes but the long-term cost can be much more expensive due to different materials being used. Since its establishment in 1976, Atlantic Graphic Systems has been a premier equipment sales and service provider. The technology of printing has been steadily advancing for hundreds of years and has become an integral part of communication. We are proud to work in this historic and dynamic field and would love to help contribute to your office. If you’d like to order equipment or services, call us at 410-290-8200 or visit our Contact Page. If you want to keep up with the latest news and information follow us on Facebook, Twitter, Google+, Pinterest and LinkedIn. This entry was posted on Thursday, June 1st, 2017	at 10:04 am	and is filed under Laminators	. You can follow any responses to this entry through the RSS 2.0	feed. Both comments and pings are currently closed.